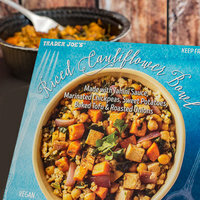 It’s officially the time of year when we'd rather eat hot cooked veggies than cold raw salads, and this hearty vegan bowl is our new favorite way to do just that! We love the unique flavors, the perfectly cooked tofu, and all that filling plant-based protein. Stash a few in your freezer to bust hunger in a hurry! Step aside, Rice Krispies Treats… There’s some delicious competition in the marshmallow snack arena! 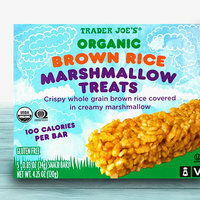 TJ’s spin on the classic sweet treat features brown rice, which means more nutrients than white-rice versions. The texture is amazing, and we love that it’s not overly sweet. Grab a box, and store a few in your work desk… Perfect for when those calorific holiday pastries start circulating the office! HG FYI: Availability will vary by location. 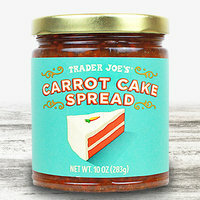 Check your local Trader Joe’s! Today, December 3rd, is National Ice Cream Box Day. We’ll be celebrating this one with a box of Enlightened Ice Cream Bars. The 80-calorie Cookies & Cream bars are calling our name! Pass along the info! Click "Send to a Friend" now.